We enjoyed a farewell for Katie Rice yesterday! Katie started dancing with us when she was only three years old and now at twelve years of age is about to forge ahead on her next big adventure, boarding school. Kinross Wolaroi is a very lucky place to get our very special Katie Carrington Rice. Stepping Out thanks you for your friendship, your spirit and for the honour of having accompanied your childhood dancing years. We look forward to hearing from you and all of your triumphs and successes over the years. We had a huge and wonderful Enrolment Day! It was fantastic to see so many of our former students and welcome so many new faces! We look forward to sharing in another wonderful year of dance with you! !I have had a few panicked calls from people who were away for Enrolment Day! Never fear, it's ok, we are still taking enrolments and ask that you contact us so we can send you through a timetable! Thankyou to everyone who has phoned and emailed. It has been fantastic to hear from you and we are thrilled you are returning! 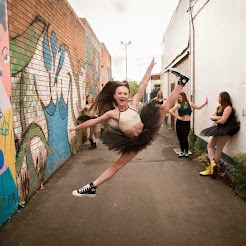 If you would like more information about 2010 please email me at rikki@steppingoutdance and i will forward you all relevant information or call me on 0413 361724. CLASSES WILL RESUME WEEK COMMENCING MONDAY, 8th FEB! We think all the kids need a week to settle back into school and of course Mums and Dads need to ease back into the extra curricular world. TO ALL OF OUR STUDENTS starting back at school or for our little ones, starting school, our very best wishes for a wonderful school year! Can't wait to see you all back in class and hear of your excellent holiday and school adventures! New studio is certainly on the way and looking schmick! Huge thanks to Gail, Tim, Dan, Miss Emma, Eric and his team and James for all their hard work in getting studio ready! !We are very excited! It's going to be beyond awesome and stay tuned for news of our special Opening Night! You are all invited! in the meantime, here are some progress shots! Congratulations to Jess & Nathan on the birth of Dakota Gregory on Wednesday, 20th January! Another little dancer! A few of our students just had to keep dancing through the holidays at various Workshops throughout the region. Cleo Ferrari had a great time at the DBS Workshop, Paris Burns is still over the moon about her week at McDonald College with guest teacher, prima ballerina Darcy Bussell and pictured here is Amber Bunt, Imogen Slack-Smith, Ondine Slack-Smith, Bella Keenan and Brinley Catto with teachers Jason Winters & J.D. We hope you are all enjoying your holidays and getting recharged for the New Year! Gail, Miss Emma and myself had a very productive day at the new studio during this week getting ready. 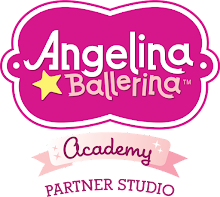 Work on the new studio will begin on the 20th of January so we will be under construction on Enrolment Day but so excited that the vision will have started!! ENROLMENT PACKAGES WILL BE SENT OUT NEXT WEEK! Please email me at rikki@steppingoutdance.com.au if you have not received your enrolment details by Monday, 18th January. I sat down and watched the Concert DVD yesterday and WHOAH, I was blown away! Congratulations to everyone. It truly was a fantastic night and the routines looked AMAZING! 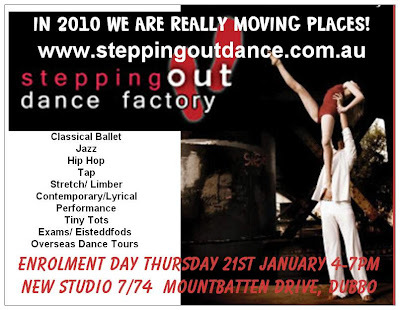 For any prospective students checking in on our blog, a big welcome and please contact us if you would like more information about becoming a student at Stepping Out Dance Factory in 2010. Happy New Year everyone! Stepping Out is very excited for the Big Year ahead! HAPPY HOLIDAYS EVERYONE!May we all soar this year and reach for the stars.